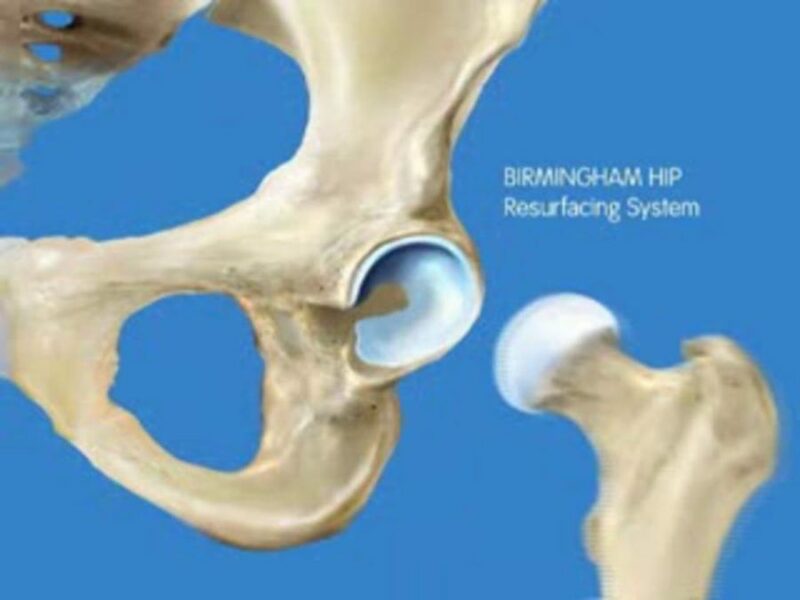 Birmingham Hip resurfacing surgery(BHR) is bone conserving alternative to traditional Total Hip replacement surgery. Total hip replacement surgery involves the removal and replacement of the whole hip joint with metal,plastic or ceramic parts. THR calls for the removal of the upper portion of the femur to accommodate the stem portion of the implant. Hip resurfacing does not remove the head of the thigh bone, the contact(articulating) surface of the head(Ball) of the Femur is trimmed and shaped and eventually a smooth metal cap is closely fitted over it. The damaged bone and cartilage in the the socket (acetabulum) in the hip bone are removed and metal shell is positioned well inside the socket in both Total hip replacement arthroplasty and Hip resurfacing arthroplasty. It is also referred to as Metal-on-Metal implant. These implants are more bone conserving devices and also preserve the natural geometry. Hip resurfacing is invariably recommended for young and active patients with strong bones as it offers greater stability, reduced risk of complications such as dislocation of the hip joint and unequal length of the lower limb and easy revision surgery,if need be. Although a great deal of research is being carried out on this subject. Different orthopedic surgeons hold different perspectives regarding the advantages of Hip resurfacing surgery over conventional Total hip replacement surgery. Your specialist will determine the best treatment protocol for you after weighing the pros and cons of each procedure. Hip resurfacing surgery can be revised easily, if need be.-Hip resurfacing at a younger age ensures smooth revision surgery later since it does not involve removal of the upper portion of the femur. Later, when revision would be required, the femur bone will be intact to accommodate the metal stem(Total hip replacement implant). However, if Total hip replacement arthroplasty requires revision surgery, the metal stem already in would have to be removed and replaced by new large diameter stem and this process is accompanied by more bone loss. Reduced risk of hip dislocation-The large size of the metal cup and cap are comparable to the patient’s original ball and socket and make it less vulnerable to dislocation. However, there are other factors as well that affect the risk of dislocation such as the type of surgical approach and the type and size of the implant. Greater range of motion of the hip joint post surgery. Hip surfacing allows young and active people to persue the activities that they used to enjoy prior to the surgery, an advantage over conventional Hip arthroplasty- A more active lifestyle. With Hip resurfacing, since the femoral neck or upper portion of the femur is retained, it results in retention of its natural mechanical attributes under stress. It also ensures less interference in the processes that are going on in the bone that is alive. In nutshell, the quality of life of the patient is significantly improved and patient is satisfied after Hip Resurfacing Arthroplasty. SCAN AND SEND YOUR MEDICAL REPORTS TO GET ABSOLUTELY FREE MEDICAL OPINION FROM TOP ORTHOPEDIC SURGEONS AT WORLD CLASS JOINT SURGERY HOSPITALS OF INDIA ALONG WITH TREATMENT COST ESTIMATE FOR THE SAME.